Every year I try to come up with a fun and unique idea for my husband’s birthday. My sister told me about a new place called Axes and Allies in Wilmington. 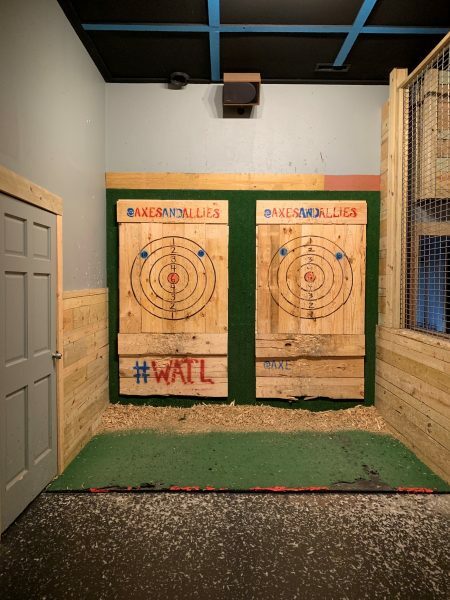 It is an ax throwing bar, where you drink beer and throw axes. My immediate response was that sounds really dangerous… but the hubs would probably love it! I got on line and made a reservation through their website for 5 pm on a Friday, which was super easy and they sent me a confirmation email to confirm the reservation. The cost for an hour of throwing was $25 per person. 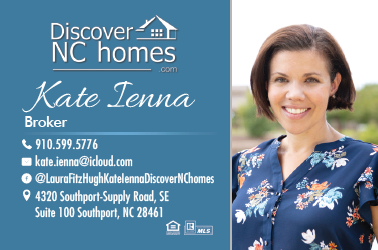 This was a surprise, so we headed to Wilmington for a night on the town. The bar is located off 3rd street in an urban part of Wilmington, we drove past the unassuming joint a couple times before finally finding our way to a small free standing building with wooden benches and table outside the front doors. Some people close bars, well we opened it. They were still prepping for the night. We were greeted by a friendly lady who welcomed us to the establishment. She had us fill out a waiver (which I did not read, but skimmed, and the take away was to be careful, because if you are impaled or injure someone else, the bar is not responsible. Gulp). 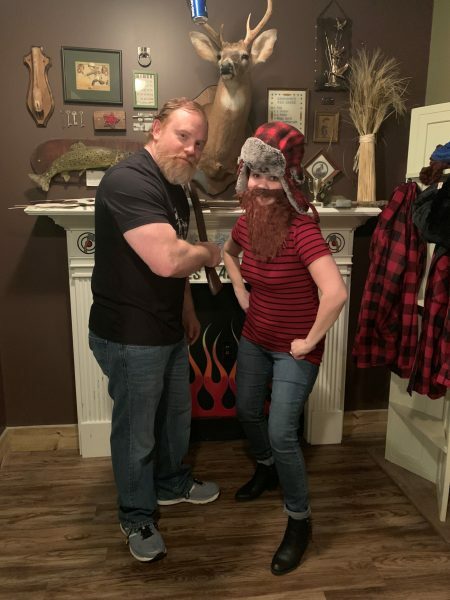 The theme of the bar is Paul Bunyan, there were cute plaid accents, axes, a fireplace photo op with props to take pictures to remember your fun night of ax throwing. There is a large bar in the middle of the room and 5 allies for ax throwing. We grabbed a drink at the bar and were off to our alley to sling some axes. A staff member came over and went over the safety rules of throwing, which included only one person throwing at a time, both guests retrieving axes together. He then demonstrated how to throw the axes. We each were given two axes a smaller ax and a larger ax. 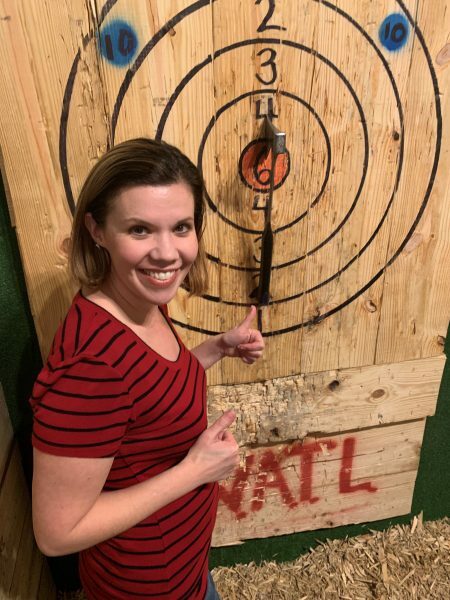 At first, it was very intimidating throwing the axes, but as we loosened up and had a drink or two, we were making bulls eyes. Who would have thought? My husband said, “Wow. 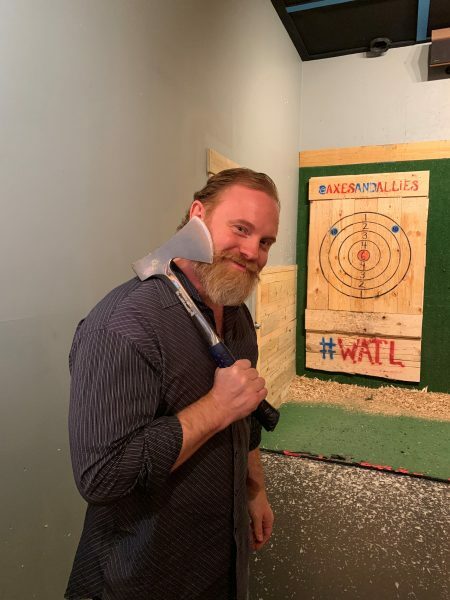 I was never good at bowling, darts, or pool, but I can throw an ax!” There was only one other group of fellow ax slingers (remember it was only 5ish at this point), who were in their 60’s and having a blast throwing axes too. 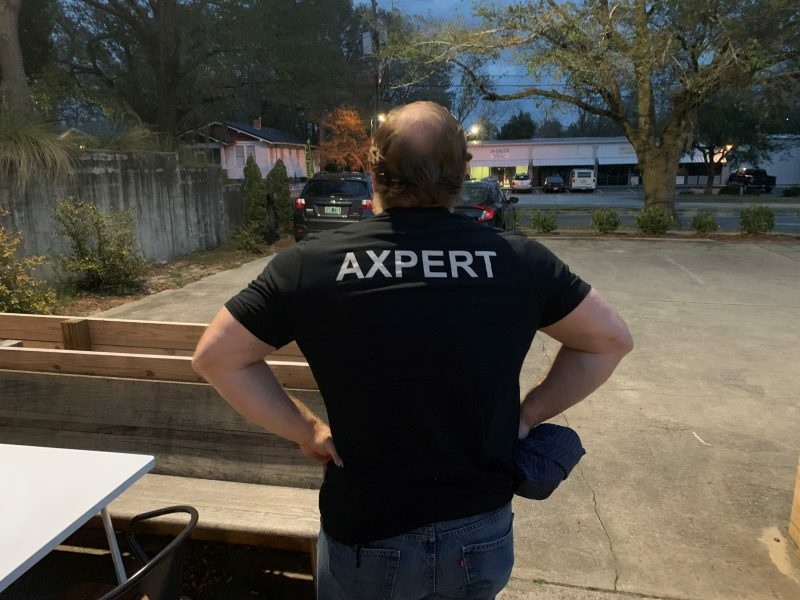 We ended the night with purchasing an AXPERT t-shirt to remember the fun night! We will definitely be back and next time we plan to bring our 11 year old. That is the minimum age you must be to sling an ax at Axes and Allies.